Photo Reflection of the Day #148: Why Did The Snake Cross The Road? 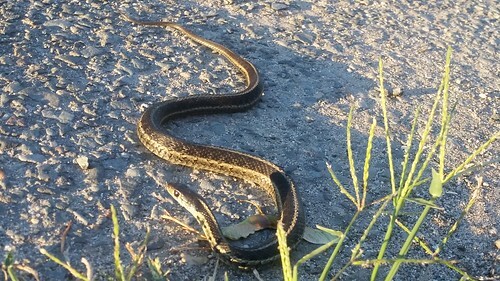 A snake that was on the road when I came back from my run this morning. Coming back from this morning's run, I happen to spot this fellow who appeared to be trying to cross the road. It was a young snake and I could tell that it was getting a bit confused with passing cars. Though freaky for many, snakes are fascinating creatures and though I could never see having one, I think it's always fascinating to observe a snake--even a simple garden snake as it makes it way over concrete. And no need to be worried, I did pick up the snake and put it into a tall bed of grass on the sidewalk. It seemed like the space out of which he came, but who knows, maybe I totally undid any progress he was hoping to make.